Imagine finding yourself in a minor car accident caused by a reckless driver. Thankfully, no one is injured, but this other driver claims you were the one who caused it. If you had camera footage of the incident, you could easily prove your innocence and be done with it. That’s something a good dual dash cam could help you with. Here we’ll take a closer look at one of the most popular dual dash cams on the market, the Z-Edge S4. We will review its main features and performance to help you decide if this model is right for you. First released in early 2017, the S4 is the successor to Z-Edge’s earlier model, the S3. Among other upgrades, this new device features a noticeably larger LCD display and a more powerful built-in battery. On top of that, it also includes an SD memory card with twice as much storage as the earlier model. The Z-Edge S4 is a great choice for anyone who cares about their own safety as well as the safety of their car. 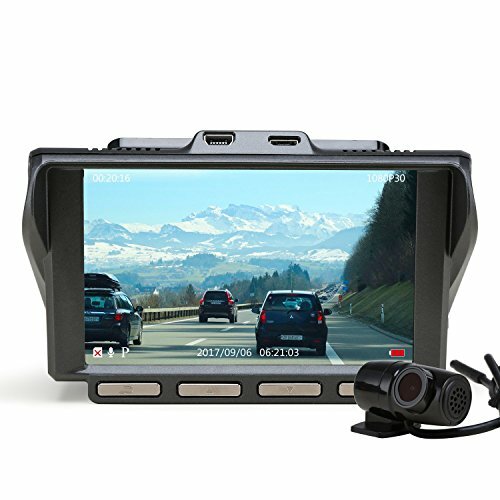 What’s more, you can use this high-quality cam to preserve the memories from your road trips and share them with your friends and family. If you’ve never used a similar device before, you might need some time to learn the ropes. This shouldn’t be a problem though, thanks to its intuitive design. This is not the most affordable model out there, so it might not be the best choice if you have a limited budget. If for any reason you are unhappy with your purchase, the manufacturer promises a 30-day money-back guarantee. You’ll also get an 18-month warranty as well as lifetime tech support. In this section, we’ll take a closer look at the main features of the Z-Edge S4 dual dash cam. Firstly, the front camera captures videos in 1440p Ultra-HD at 30 fps, while the rear camera records in 1080p full HD, also at 30 fps. Both have a wide recording angle of 150 degrees, which is enough to provide a clear overview of the three lanes in front of the car and behind it. Many dash cameras have difficulty capturing clear and crisp video at night, but not the S4. Its wide dynamic range (WDR) functionality is enhanced with a built-in extra-sensitive sensor from Sony that gives this device remarkable night vision. Once you’ve configured the device properly, you won’t have to switch it on and off manually anymore. Every time you start the car, the camera will start filming automatically. Similarly, stopping your car will also stop the recording. But this doesn’t mean that the camera can’t record while your car is parked. On the contrary, the device has built-in sensors that allow it to detect any movement around your car. When they do, the camera will automatically start recording, thus allowing for 24/7 parking surveillance. Loop recording is a method that allows for more efficient use of your dash camera’s storage. As a rule, most devices can only store a few hours of footage at a time. They’ll divide the real-time footage into short clips and store each of those clips individually. Once the storage limit is reached, the dash cam starts recording over the existing footage, starting with the oldest clip. The S4 has a maximum storage of up to 128GB, which is at least twice as large as what most comparable models offer. This means that you can store up to six hours of footage at any given time. There’s also a 32GB memory card included in the packaging, so you can start recording as soon as you set it up. In case of sudden bumps, shakes or collisions, the dash cam will permanently store the footage of the impact to prevent it from being overwritten. This way, you’ll have valuable evidence in case of an accident. Most comparable models come with a battery that can only last long enough to perform an emergency backup. Unlike them, the S4 has a 600mAh lithium-ion battery that can record for up to 30 minutes without a power supply. This could be particularly useful if your car battery suddenly dies while on the road. The main shortcoming of this model is that it doesn’t have a built-in GPS support. Furthermore, it isn’t waterproof, which means that you shouldn’t mount the rear camera outside of your car. Neither of these should be a major setback, seeing as most similarly priced models have the same shortcomings. To install this device, you should first mount the front camera on your windshield in line with the rearview mirror. Then you’ll have to do the same for the rear camera. Now take the 19.6-inch USB cable and use it to connect the two cameras. Finally, take the micro USB cable, plug one end of it into the front camera and the other end into a car charger. After you’ve done all this, you can turn on the device. All you have to do is to follow the instructions in the manual to configure your new dual dash cam properly. If the lack of GPS functionality is a deal-breaker for you, the Rexing V1LG might be a good alternative to the Z-Edge S4. They cost approximately the same and have many of the same features, but the V1LG also has a built-in GPS logger. It also has a wider recording angle (170 vs. 150 degrees), but the rear camera can only output video in 720p standard HD as opposed to 1080p full HD. The Z-Edge S4 is a great dual dash camera that offers a lot of advanced features at a very affordable price. While it doesn’t have GPS functionality, the excellent video quality, superior night vision and automatic recording more than make up for this minor downside. And if that’s not enough, you’ll also get a 32GB memory card that can store about 90 minutes of footage.